Those are the words of Ramsay Burt, author of The Male Dancer, and they are part of the inspiration behind Amy Elkins' stunning photography series, "Danseur." 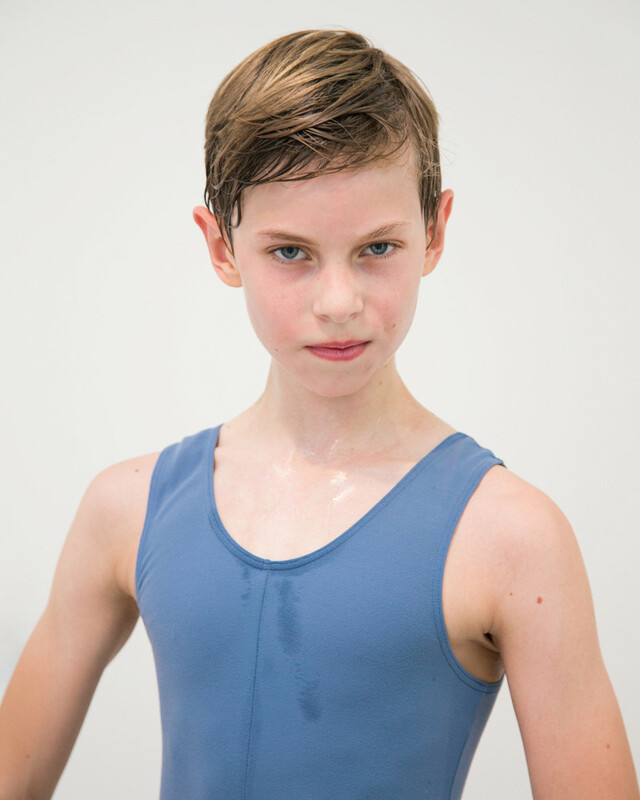 For the project, she captured portraits of young male dancers in Copenhagen, Denmark, moments after intensive training. The subjects, ages 12 to 28, stare purposefully at the camera or glance wistfully into the distance, projecting diverse interpretations of what it means to be a masculine athlete. "I am fascinated with the art and sport of ballet and contemporary dance, specifically with young men who push past gender stereotypes associated with dance and challenge societal notions of masculinity," Elkins explained to HuffPost. Framing the men in her images alone, basking in light, she presents both the vulnerability and strength involved in their very different portrayals of male identity. While a second year student of the Royal Danish Ballet School stands comfortably in front of Elkins' lens, hands intertwined and a calm expression fixed on his face, an older member of Dansehallerne appears in a hypnotic state, his arm twisted around his face and his eyes tightly shut. The Los Angeles-based Elkins has spent some time exploring the realms where gender-based stereotypes and male identities are pushed to their limits. In a series titled "Elegant Violence," the photographed dove into the world of rugby, creating vintage studio portraits of athletes who demonstrate both sheer aggression and athleticism, as well as intimate body contact and physical grace. Similarly, in "Wallflower," she situated her subjects in front of floral wall prints, stripped of clothing or any other context that would point to their personal self. She reverses the traditional male-on-female gaze, questioning what aspects of beauty we associate with specific genders. While "Elegant Violence" and yet another series, "Black is the Day, Black is the Night," centered on prisoners serving life or death row sentences, focus on the hyper-masculine, "Danseur" moves to the other end of the spectrum. While it's clear the men pictured are not only physically adept but also psychologically determined, their bodies are channeling postures and expressions not typically -- or, stereotypically -- matched with masculinity. See a preview of the works below and head over to Elkins' site for more.